やっぱりアメリカ人: Peanut-Butter-Chocolate-Chip Brownies – I'll Make It Myself! It’s the nature of an expat to be perpetually food-frustrated–if I’m in Japan, I want turkey and fancy cheese; if I’m in America, I want bamboo shoots and yuba. The ultimate American comfort food for me is peanut butter. 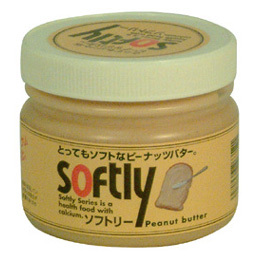 Peanut butter is a quintessentially American food and Japan just doesn’t get it. There’s no dearth of interesting foods to eat in Japan, of course, and there are a lot of good Japanese substitutes for ingredients, like nerigoma for tahini. That said, Japanese “peanut cream” is basically peanut-butter frosting in terms of sugar content and consistency, so, while I’m sure it’s lovely on white cake, it’s horrifying as a peanut-butter substitute. This is what sadness tastes like. After the quake, all I wanted was some sort of comforting American-style peanut-butter and chocolate sweet, but I couldn’t bear to use my fancy Alishan peanut butter in baking. Luckily the big grocery store by my gym carries Meidi-ya peanut butter. This brand is a bit sweeter than I like, but it was good for cooking and came in a glass jar instead of the plastic ones the tiny and overpriced imported Skippy comes in. Regarding the actual recipe, Cooking Light has become my go-to site for baking this year because the magazine’s philosophy is the same as my own: make it from scratch and make it healthier. I need to ascend my soapbox for a moment and say that I dislike the American trend of buying low-fat, low-carb, low-cal prepared foods. I can taste the preservatives, and the amount of non-recyclable/reusable packaging is obscene. Cooking Light focuses on three things: 1. learning about food; 2. learning how to cook with healthy ingredients; and 3. revamping classic recipes so as to be lighter without sacrificing the flavor. That is, it’s not about paying lip-service to a diet, it’s about making conscious decisions about food and being able to enjoy your meals. Desserts included. These brownies are the perfect combination of peanut-butter and chocolate and have the lovely brownie top and texture. What’s best is that a brownie pan (8x8in; 20.5×20.5 cm) is the perfect fit for the Japanese oven range, so there’s no need to worry about the center not cooking through. 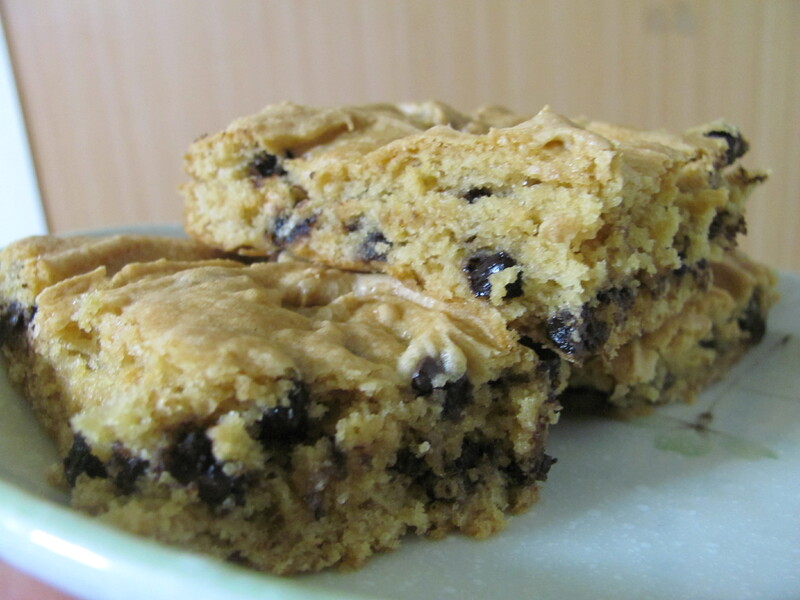 Adapted from “Peanut Butter – Chocolate Chip Brownies,” Cooking Light (June 2000). 1. Preheat oven or oven range (yonetsu, 予熱) to 175° C (350F). 2. Coat the bottom of the baking pan with cooking spray or just a little bit of oil on a paper towel. 3. Lightly spoon flour into a dry measuring cup and level with a knife. Combine flour, chocolate chips, baking soda, and salt in a bowl. 4. Combine white sugar, brown sugar, peanut butter, oil, vanilla, and eggs in a bowl, and stir until well blended. 5. Add flour mixture, stirring just until blended. Spread batter in bottom of prepared pan. 6. Bake at 175° (350) for 25-30 minutes or until a chopstick inserted in center comes out almost clean. Ugh, peanut cream. I remember one of the first times I visited Japan, I was really jonesing for a pb&j so I bought what looked like one from a random conbini. It was actually filled with peanut cream, so it was a bit of a shock when I bit into it. I don’t get that product at all. Real peanut butter is about a billion times better! P.S. Made this today substituting half of the flour for whole, and using a mix of white and dark chocolate peanut butter. It was great! I’m a big fan of whole wheat flour, so I’ll have to try this! Sadly, there are no chocolate peanut butters at the import stores for me to try. Glad you liked it! 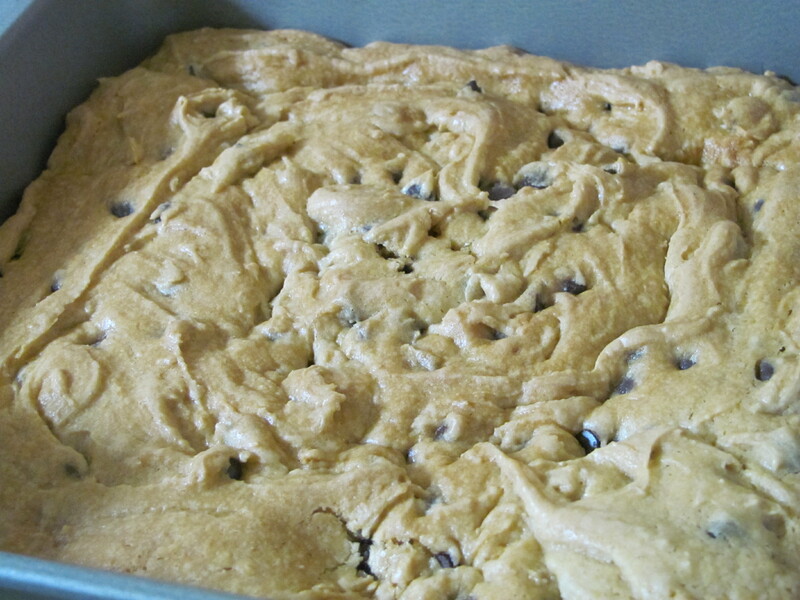 Pingback: Photo Update: Peanut-Butter Chocolate-Chip Brownies | I'll Make It Myself!